Tuition level for most in-state students, up for out-of-state, graduate and engineering students. Chancellor Patrick Gallagher speaks at a Board of Trustees meeting in February. 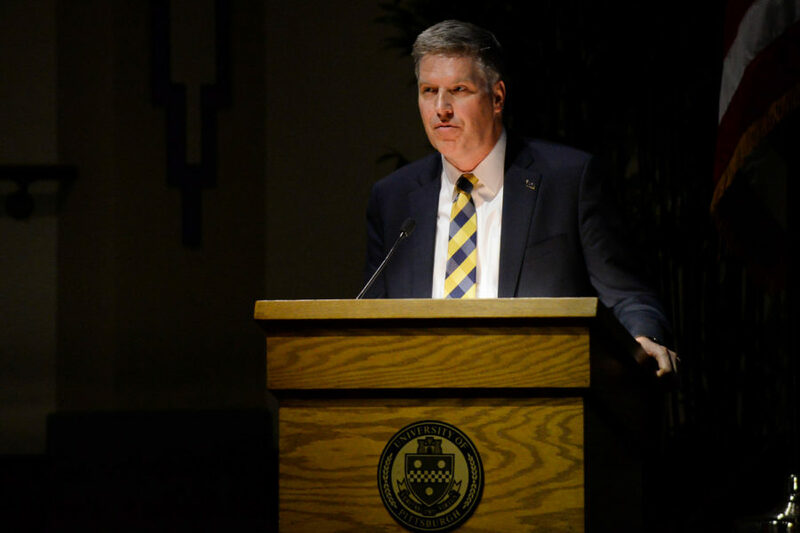 The Pitt Board of Trustees approved the 2019 operating and capital budgets Monday morning, according to an email Chancellor Patrick Gallagher sent to the University community. The new budget — which includes a $4.4 million increase from the Commonwealth of Pennsylvania — keeps tuition rates stable for the majority of in-state students, but increases tuition rates for other students. All graduate and out-of-state undergraduates students at the Pittsburgh campus will face a tuition increase, and all engineering undergraduate students at both the Pittsburgh and Johnstown campuses will face increases as well. “The tuition rate for out-of-state undergraduates on our Pittsburgh campus will increase by about $1,400. Tuition will remain flat for Pennsylvania students, excluding the Swanson School of Engineering. These students will pay $19,726 to support costs associated with the program,” University spokesperson Deborah Todd said in an email on Monday. Pitt’s decision to freeze the cost of in-state tuition comes after the State System of Higher Education’s board of governors approved a new tuition increase for Pennsylvania’s 14 state-owned universities on Thursday, July 16. Last year, the Board of Trustees raised both in-state and out-of-state tuition for Pitt students by $442 and $864 respectively. Graduate student tuition rates vary according to the school and program. The yearly rate for the School of Medicine’s graduate program will increase by nearly $1,000 for in-state students and almost $2,000 for out-of-state students. Yearly tuition for undergraduates in the Swanson School of Engineering will rise from $25,586 to $26,224 for in-state students and from $42,458 to $44,474 for out-of-state students. The new rates for other schools can be found here. Gallagher’s email also said that the Board passed a $2.3 billion operating budget. That money will go toward “investing in vital areas, such as research, academic excellence and economic development,” he said in the email. This year’s $2.3 billion operating budget is an increase from last year’s $2.2 billion budget. Pitt’s 2018-19 capital budget will see a similar increase. The budget allocates a $339.5 million capital budget, which Gallagher said will allow Pitt to “address deferred maintenance and make needed renovations” to University facilities. A press release from the University indicated that the capital budget will support investments such as renovations to Hillman Library and Salk Hall, and the redevelopment of 5000 Baum Boulevard — the future site of Pitt and UPMC’s Immune Transplant and Therapy Center. Other projects will include expanding the utilization of the Petersen Sports Complex and supporting energy-saving sustainability projects. An $819 million dollar research base will also be distributed from Pitt’s budget this year, which is up $11 million from last year’s record-setting $808 million. The new budget also funds a 2.25 percent increase to the faculty and staff salary pool, according to a statement sent to faculty and staff Monday afternoon. “Faculty and staff members who performed satisfactorily may be eligible to receive a maintenance increase of 1.5 percent. Additional funds of 0.75 percent are available for faculty and staff eligible for a merit, market, or equity increase,” the message from Senior Vice Chancellors Greg Scott and Art Ramicone said. Gallagher thanked lawmakers in Harrisburg for the increase in Pitt’s state funding this year. “I am thrilled to extend this valuable partnership with the state and grateful that leaders in Harrisburg have voted to strengthen their investment in Pitt and, in turn, our Commonwealth’s future,” Gallagher said in the email.